FloorPrice is not the advertisement-supported program you can trust to provide you with reliable offers and recommendations. The application has been developed on the infamous justplugit engine which is now well known by malware researchers for aiding the production of unreliable browser extensions. According to our researchers, justplugit applications are usually related to unpredictable online advertising, and so we advise that you delete them as soon as possible. In this report we will show you how to remove FloorPrice. There are a few distinctive features that all justplugit applications share and why you should delete them from the system. First of all, none of them are available for downloading on official sites. As a matter of fact, some of them, like FloorPrice, are not represented in an official manner at all. Secondly, Tinywallet, Saveitcoupons, CouponAddon, and other justplugit applications are usually distributed using unreliable bundled Installrex installers. Note that other third parties, like Amonetize or Vittalia, may get involved as well. Lastly, all justplugit applications require immediate removal because of the related advertising. The suspicious FloorPrice may offer you alluring services; however, what this program has been created for is online advertising; otherwise, we would not list it as an ad-supported program. As mentioned already, you have to delete FloorPrice from the system, because if you do not, it could be utilized to expose you to offers linked to unreliable parties. Of course, FloorPrice ads may promote real services, saving deals and installers; however, unreliable and worthless offers are likely to show up more frequently. Some of the displayed offers could be so misguiding and clever that you could be tricked into installing malware onto the PC yourself. This is extremely dangerous and troublesome because the removal of malicious software is usually more complicated. You do not need to interact with FloorPrice ads to invite malware onto the system. 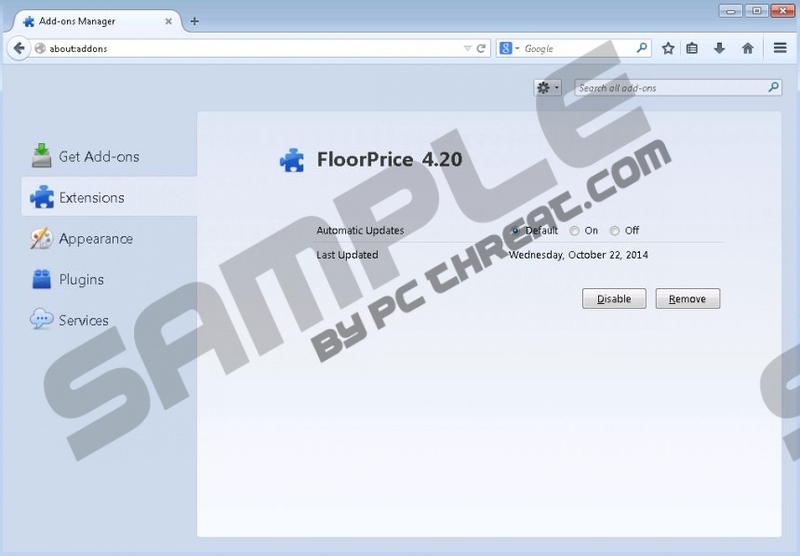 It is now known that third-party installers promoting FloorPrice could also introduce you to other infections. Therefore, if adware is running on the PC, it is important to find out other running threats. Have you not noticed any suspicious activity or unfamiliar programs? Unfortunately, some of them could be clandestine and run without being discovered. Click the download link to acquire a scanner which will inform you about the threats that require removal. Use automatic malware removal software to delete them or follow the manual removal guides. Have you decided to delete FloorPrice manually? Do not forget about the infections which may be active without your notice. Remove these programs to ensure that they cannot put your virtual security at risk. Access the Metro UI menu screen, right-click to open a new tab and select All apps. Open the Control Panel to access a different menu and click Uninstall a program. Locate the application you wish to delete, right-click it and finally select Uninstall. Navigate to the Task Bar at the bottom of the screen and click the Windows icon. In the menu select Control Panel to open a new menu and click Uninstall a program. Now right-click the application you want to delete from the PC and select Uninstall. Navigate to the Task Bar at the bottom of the screen and click the Start icon. Open the Control Panel and in the menu double-click Add or Remove Programs. Locate the undesirable application FloorPrice, click it once and select Remove. Quick & tested solution for FloorPrice removal.